The Yashica T4 Super is a micro sized Auto Focus camera with an ultra sharp Carl Zeiss Tessar T* lens. (Not against the camera): The Yashica brand doesn't "exist" anymore, so you will not find support from them. Not Applicable: I never had to call them. Other Kyocera cameras, as well as Olympus, Nikon, Samsung, and Sony cameras. Owned for 8 years. Camera produces excellent pictures. I use with Velvia slide film and find the lens resolution is more than adequate. Despite plastic construction, I've taken trekking in Nepal twice and dropped from shoulder height onto concrete - still works fine. Great for outdoor photos; not great for portraits. Construction? My first T5 died - my current T5 has been very reliable Fiddly controls It is bulkier than newer models. My first T5 died - it kept locking up unpredicatably. I exchanged it for another and I am glad that I did. I carry it around with me most of the time to take landscape and portraits, mainly black and white. I am very impressed with the quality of the images the camera has produced. They have a really nice, sharp quality. The camera copes very well in low natural light with the flash turned off - I enjoy taking portraits in these conditions - the results so far have been impressive and for most situations as good as my manual SLR. I've only been using a Canon SLR before trying to get a good P&S for my overseas travels with the family. D*** lucky to get a brand new T4-last piece- from a big department store at only S$160. That's about USD$90. Another smaller photo shop was quoting USD$160. Chose this over the Epic II because of the price and well, they don't produce T4s anymore. I've ran thru only 3 rolls so far but am very pleased with the quality of the pictures, esp outdoors. The colours are simply awesome. Sharpness at all corners is comparable to my 50mm 1.8 Canon lens. Not very pleased initially though with the sensitive shutter button, but have learnt to adjust. Portraits produce nice fuzzied backgrounds if correct mode is chosen. Agent was quick but not careful. Left fingerprint on lens! Unbeatable price vs performance value. Super sharp Carl Zeiss Tessar lens. Excellent T* coating - superb contrast. All Plastic housing. Weak Flash, not good indoors. Outdoors in sunshine - excellent! Fantasic camera for the price, a super sharp lens and top contrasty images. I can hardly tell the difference between 7x5 snaps from this camera and 'high-end' point and shoots - and before you say change labs, I also send my film direct to www.fujilab.co.uk for all processing. Breaking news! 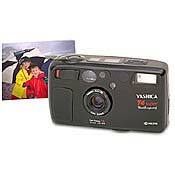 - this camera has now been superseded by the Yashica T4 Zoom, see www.yashica.com for more details. You heard it here first! Leica C1, Leica Minilux Zoom, Contax T3. 1. Is NOT dust or moisture proof. Lens cover and lens will jam easily. 2. Hair trigger does not allow for proper focusing. 3. Distance setting returns to default after each shot. Only camera that I know that does this. So...after each shot you willneed to fiddle with the little buttons on top. Camera has several killer problems that make it less than useful: strongly recommend looking at alternative. My T5 is the camera I carry all time when my SLR equipment is too heavy. After having tried several P&S cameras and going through some really bad experiences with a Canon Ixus (flimsy construction, very poor lens), I swapped it against the Yashica T5. Having owned a Rollei 35 before, and after the bad experience with the Ixus, I was initially very reluctant to buy another camera without having a possibility to manually influence exposure. But this camera is great! The images are very sharp and contrasty and the metering system works well in most situations. A side by side comparison with a consumer grade SLR system at 4x the price showed that exposure and sharpness of the slides were way better with the T5. However, the T5 remains a fully automatic P&S camera and should not be compared with a good SLR. You''ll not have control of exposure, depth of field etc and the flash is not great (I turn it off most of the time). As in many P&S cameras, there is quite a bit of shutter lag, but since I use it for travel and landscapes this is not a serious issue. Having read some of the opinions about the camera, my impression is that many negative comments come from people expecting the functionality of a full-blown SLR at many times the price just because it has a Zeiss lens. For example, if you photograph children or animals, a 35mm lens is probably too short anyway. For it''s price it is a very good buy. And if you know its limitations, you''ll be very happy with it. I purchased the Yashica T4 after a recommendation from a professional photographer friend and after seeing another friend''s photos from her travels which were contrasty and in sharp focus. I also wanted a p&s camera that had autofocus but had some degree of adjustability to replace my aging manual focus pocket cameras and for those times when lugging around an SLR or medium format camera didn''t make sense. My initial impression of the T4 was that the Carl Zeiss lens would be stellar and overcome any other deficiencies ie. manual over-rides, that the camera would have, especially since I have been using my Rollei 35 (Carl Zeiss 40mm f3.5 Tessar) with great results. The Rollei has a very sharp lens even considering that the focus is by guestimating the distance or using the hyperfocal distance but a lack of built-in flash and all manual settings meant that quick shots were not as easily taken. Unfortunately, I was mistaken about the T4. The camera is too large to be considered a "micro-sized" p&s, the buttons are too small and finicky, there is a noticable time-lag between when the shutter release is pressed and when the shutter actually releases, the settings are not retained when the power is turned off, there are no manual over-rides, there is no viewfinder / display lumination in low-light and whenever I handed the camera to one of my friends to shoot, inevitably, the photos would turn out blurry. Yes, one can suggest that the person taking the photo just can''t keep their hands still... but this occurred often and the whole idea of a p&s camera is exactly that and should not require a large degree of knowledge to perform adequately. It made me wonder if gremlins were invading the camera each time or if the three beam autofocus was too precise and only worked for those diligent enough to ensure that they were aiming correctly. Having said that, I was satisfied with the sharpness of the photos that I took, exposure was also very good in outdoor shots and acceptable in most indoor situations. I especially felt confident using the slow flash-sync mode that is available in the "Flash-In" mode. The weather-proof feature was also reassuring during my camping and other trips although the camera is too bulky to carry in any pocket other than a heavier jacket pocket. However, overall, this camera does not give enough value for the money. Handholdable and all the buttons in all the right places. A definite A+ on the line of appreciation. Less is more so to speak and this magic box does it all with zest and pinache to spare. Knowing it is knowing what photographic excellence with ergonomic ala mode is all about.